MOST VERSATILE BAND AVAILABLE – This resistance band is more versatile than any other band; the attachment loop will give you extra workout options that you won’t have with a normal band. Use the attachment loop to connect to a handle, ankle cuff, any attachment or just use it to quickly connect to the pull up bar. STILL FUNCTIONS LIKE TRADITIONAL BAND – Ignore the attachment loop when you don’t need it and you still have all the exercise options of a traditional resistance band. The attachment loop is great but some exercises don’t need it so just slide the loop out of the way and do your exercise. 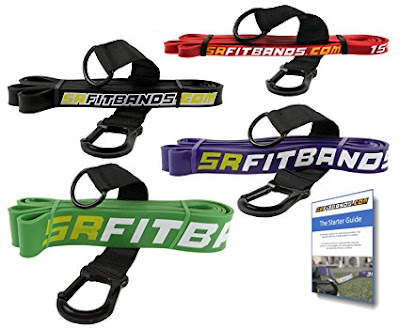 TRUSTED BY ATHLETES – Whether you are the Athlete, Coach or Trainer; the SR Fit Band will help unlock your potential and get the most out of your training. One of the best bands I've used so far. I can tell is much better quality than some of the other bands I've tried. It's very sturdy and I love the fact is has the hook so you can attach to anything including ankle straps! I use at home and even bring it to the gym since it's better than the ones they have there. I have only used this product for a few weeks now and can already see the versatility they will add to my program. The carbeaner clip has added numerous aspects to workouts. I can focus on strength, flexibility, range of motion and many other areas that will help develop my athletes overall as well as specific to an event. Durability wise they feel sturdy and strong and up for frequent use in my program. I travel frequently for work and often times the hotel gyms have very little to offer. These resistance bands allow me to use whatever equipment is available and increase the weight capacity so I can engage in a much better workout and pump. I also use these at work just prior to me leaving for the gym to warm up and stretch my muscles. This gives me more time to actually work out when I enter the gym.